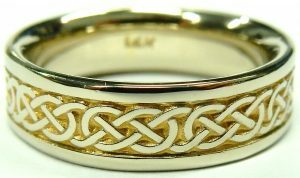 We have hundreds of traditional wedding rings like this for less than you’d expect. Plain Tiffany style wedding rings like this are the timeless symbol of marriage and commitment. We have them in various karats of gold and even a few in platinum. Wide, narrow, big or small we have them all. Wedding rings are continuously coming in on trade. If you’ve been married for a while I bet your wedding ring is yellow gold but you’re likely wearing a stainless steel watch. This premium quality 18 karat white gold wedding ring should match that sporty stainless watch much better. If you have a diamond set wedding ring, a simple looking wedding ring for the weekend or going on holidays may be more appropriate. These experienced wedding rings make a great option. For under the wholesale cost of new these wedding rings can be refinished to look perfect. This example measures a comfortable and discreet 4.4mm wide and a finger size 9 1/2. This ring can easily be made smaller or a bit bigger. Super comfy with a rounded inner edge and a generous height of 2.4mm. The “Tiffany” style soft dome profile has always been the preferred look for wedding rings for over 100 years. Polished up and ready to go for the estate price of only $575.00 CAD. Stock #e12053. Princess cuts may be losing ground as the “it” center stone for engagement rings but they are the diamond to beat for anniversary bands. Nothing else provides the seamless, uninterrupted brilliance that princess cuts set girdle to girdle create. In a channel setting they are well protected and ultra-sleek. This open ended channel increases that modern motif by spanning the entire width of the finger with distinct narrow bars. Together the 11 I1-JK diamonds make a perfect 0.50 carats. The 14 karat white gold ring is a generous finger size 8 with some limited room for adjustment. Estate price $560.00 CAD. Stock #e11979. The origins of iconic designs are often forgotten, we get so used to seeing them and the associated brands they belong to that we forget that they didn’t always exist. Mention Rolex and their elongated pointed crown comes to mind automatically. That symbol was chosen in 1908 as an embodiment of the company’s slogan “A Crown for every Achievement”. The same applies for the screw head from the Cartier LOVE line of jewellery. 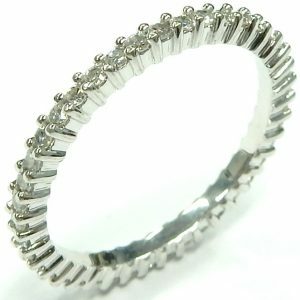 Originally introduced in 1969 as a bangle bracelet accompanied by a screw driver which was required to remove the bracelet. Though you can still purchase modern versions of the bangle, the screw head has moved into every manner of jewellery for Cartier. This 6mm wide statement band is a current offering from that collection. Made from 8.6 grams of 18 karat white gold currently measuring a finger size 9 1/2 the band is available new for $1770.00 US (or about $2240.00 CAD). Our estate version of model B4084761 is appropriately priced for $1232.00 CAD. Stock #e11978. Being voted Barrie’s favorite jeweller 19 years out of 20 by our community is a genuine honor, we take your recognition very seriously. There are many accomplished jewellers in the area who provide some great products. None have been in Barrie longer than we have and none have the depth of inventory, knowledge and passion as the team at Bill Le Boeuf Jewellers. As we launch into our 7th decade of operation in Downtown Barrie our sense of tradition and passion only grows stronger. Our skills plus efficiencies of operation allow us to provide our customers the absolute best value in all varieties of new and estate jewellery. Values like this 0.50 carat total diamond anniversary ring are truly remarkable when you compare what others charge for similar. It’s no wonder we’re busier than ever doing business from our one and only location at 52 Dunlop Street West. The 14 karat white gold ring is in like new condition measuring the average finger size 6 1/2, weighing 2.3 grams. The solid shoulder design contains 10 sparkling channel set round brilliant cut diamonds conservatively graded I2 clarity and I colour. Despite their modest clarity you’ll be surprised at the twinkle they display. If you need the ring adjusted in size up or down one of our onsite goldsmiths can accomplish the task in only a day or two. We have many other anniversary rings in stock that don’t appear online. Come in to see what else we have and what we’re all about. This like new example is estate priced at only $360.00 CAD. Stock #e11997. Premium quality and construction 18 karat for less than the cost of mass produced 10 karat. Custom made gents wedding ring crafted by local goldsmith Michael Smiley. The ring is in like new condition measuring a slightly larger finger size 11 1/2. The highly polished finish with low dome Tiffany profile has always been the most popular wedding ring design. Weighing over 7.5 grams and measuring 5.7mm wide this ring is comfortable and subtle. If you’re not a size 11 1/2 not to worry, one of our onsite goldsmiths can have it adjusted up or down (sometimes while you wait). It’s always a treat to showcase one of Michael’s creations in our estate department. Michael has a great following in the Barrie area so we don’t expect this ring to last very long. Estate priced at $550.00 CAD. Stock e12006. Effy Jewelry is a big brand for the cruise ship traveler. The jewellery manufacturer specializes in bold colours and pave set diamonds. This 14 karat white gold halo is a nice example of what they are known for. With its tricolour rectangular shaped pave set cluster measuring 14mm x 11mm it makes a statement without being overwhelming. All together the ring contains 1.00 carat of diamonds divided into two rowsof black diamonds, one row of white and a cluster of cognacs. At a small finger size 4 3/4 and weighing 3.9 grams this ring can easily be sized up to accommodate the more typical finger. Estate price $780.00 CAD. Stock #e9460. There is a good chance this what your great grandmothers engagement ring looked like. That is if she was fortunate enough to get one. Many young brides of the time only wore a simple wedding band as there was precious little money around back then for luxury items like a diamond ring. 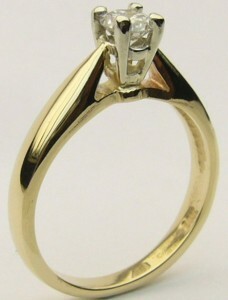 The simple 18 karat yellow gold six prong setting contains a pretty 0.25 carat European cut diamond of SI1-G quality. A tiny little chip on an upper facet is evidence of a ring that was enjoyed and worn all the time. Tiny chips are quite common on very old diamonds due to the practice of cutting the girdles to a knife edge finish 100 years ago. The little ring weighs 1.7 grams, measures a size 7 and still retails the Ryrie Birks trademark. Estate priced at $420.00. Stock #e8012. Here’s a refresher course in case you’ve forgotten the symbolism and discreet messages the Claddagh design is said to convey. The Claddagh ring has been around for hundreds of years. It’s an Irish tradition steeped in meaning. Made up of three parts, the hands, a heart, and a crown. The design is meant to symbolize the three promises of a relationship; friendship, love, and loyalty. Depending on how it’s worn the ring can say a lot about your relationship status. If your “heart is open” (you’re single) the ring would be worn on the right hand facing away from the body. Engaged? It should be worn on the left facing out. After you are married it is to be turned in toward the body after the wedding. If your “heart is closed” the heart should again be facing toward the body but on the right hand. We’ve had plenty of Claddagh rings come and go through our estate department but not a single one has been anywhere near as heavy as this one. Most weigh around 2 or 3 grams, this one is just shy of 10.5 grams. Definitely not a production ring. This ring was likely hand made by a goldsmith student who didn’t realize just how heavy the finished product is compared to a wax prototype original carving. The detail is a little more basic than we’ve seen before but the iconic design certainly can’t be confused with anything other than a Claddagh ring. The size 6 ring can be made a little bigger or smaller to fit you perfectly. Estate priced at $630.00 CAD. Stock #e11167. For more than 500 years Britain has been hallmarking precious metal objects. The system of symbols and letters identifies the maker, the quality and content of precious metal, the city where the item was assayed and the year it was made. 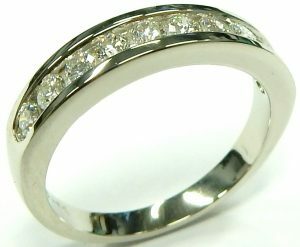 This size 7 1/2 eternity ring is made from premium 18 karat white gold containing 0.50 carats total weight of high quality VS-H channel set round brilliant cut diamonds. At just 2.9mm wide and 2.2 grams in weight this ring will compliment any flat edge engagement ring or it could easily be worn on its own. The tightly set diamonds are secured deep in a channel setting making for a smooth, long lasting, low maintenance design. The inside of the ring has been drilled with pilot holes that allow for easy cleaning. Excellent condition just needing a quick polish to make it look like brand new. Estate priced at $910.00 CAD. Stock #e11193. Pink sapphires are usually a pale pink lemonade colour this one however is far more saturated, it weighs approximately 0.70 carats and is set in a yellow gold half bezel setting. This is a very lively and bright example of a fairly rare and unusual variety of the mineral corundum. Bezel set on each shoulder is a 0.07 carat round brilliant cut diamond SI-J quality. The setting measures a finger size 6.5 and is assembled from yellow and white gold weighing 3.7 grams. Estate price $630.00. Stock #e7224. A big ring for a petite price point spanning an impressive 10mm in width. You may marvel at how this ring can be estate priced at $336 (less than $6.00 per diamond). The ring was mass manufactured likely for television sales or big box store retail. Cast in 10 karat rose gold and set with 57 I1-JK single and full cut diamonds that equal 0.20 carats. That total diamond weight speaks volumes to the tiny scale of the stones; it would take close to 300 diamonds of the size used in this ring to equal 1.00 carat in weight. Not to undo the aesthetic of the ring, its perfectly on trend with its combination of rose gold and bright white rhodium. 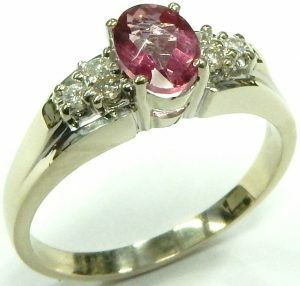 We feel a competitive retail price for the ring new is $480.00 CAD. Condition looks unworn it is estate priced for only $336.00 CAD. Stock #e11927. Canadian diamonds come in all shapes and sizes. Their quality is usually a little better than the average because each Canadian diamond that reaches the final market goes through a certification process. This extra step costs a little more due to laser engraving a unique registered number, producing specific packaging and certificates. At one time only Canadian diamonds bigger than 0.30 carats received this registered treatment but now almost any size Canadian diamond is registered. 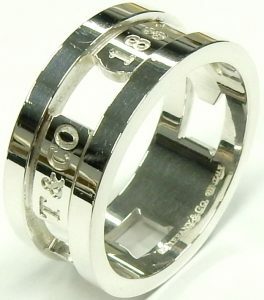 The 10 diamonds in this 2.1 gram 14 karat white gold anniversary ring are all engraved with a registered number. They are all matching I1 clarity with a very nice F colour. Originally purchased at Canadian Jewellery chain Ben Moss Jewellers. This ring comes with all of its original packaging, certificates and a pamphlet describing the exclusive 68 facet diamonds they use. In like new condition showing no wear and tear. This flat edge ring will fit almost any similar flat edged engagement or wedding ring. Estate priced at $630.00. Stock #e8964. This softly geometric solitaire is very well made with full shoulders and generous solid construction. It was originally sold in Canada by recently bankrupted now back in business Ben Moss Jewellers. One of the tell tale signs of mass production for the chain stores are hollow inside shoulders, thin shanks and generally light weight manufacturing. The hollowed out sections and light weight allow stores to cut costs and increase profits. This 3.4 gram 14 karat white gold engagement ring was left fully intact. Appropriately so as Ben Moss crowned the ring with a higher quality diamond than you’d normally encounter in the average mall store. That 0.30 carat princess cut diamond is a bright and lively VS1-H quality of Canadian Maple Leaf origins. All Canadian diamonds have been laser engraved with a unique registered number and this example is no different. The elegant and understated solitaire is currently a finger size 5 1/2 with room to size up or down as needed. Estate price $980.00 CAD. Stock #e10623. The fashion police may not agree but I like two tone gold, especially when it has contrasting finishes. 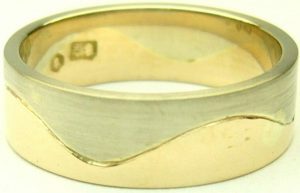 This 14 karat white and yellow gold flat band measures 5.5mm wide with a finger size of 6. It could be used as a funky wedding ring or just a cool ring to wear. 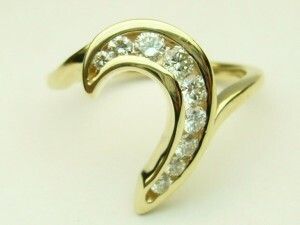 The wave design is highly polished yellow gold on one side with flat brushed finish white gold on the other. Weighing 4.4 grams the ring is estate priced at $350.00. Stock #e7625. Larimar is a semi precious gemstone found exclusively in the Dominican Republic. Fitting as the colour captures Caribbean waters lapping on a white sand beach. Even more so in this 4.75 carat cabochon cut larimar which exhibits a slightly deeper blue on the right hand side transitioning into an almost white blue on the left hand side. Looking at the pictures you may doubt that description but the white is a hidden phenomenon not visible head on. To find it you must turn the gem until you are looking just at its left hand side. As you do so the white rolls up the stone like a white cap building speed. A fascinating colour change that you must see in person! 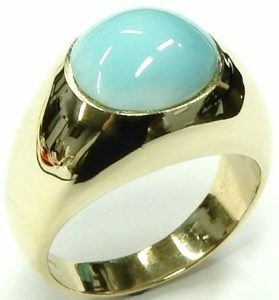 This unique example of larimar is housed in a heavy and durable 10 gram 14 karat yellow gold ring that currently measures a finger size 8 1/2. 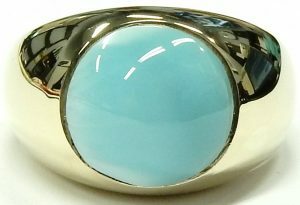 Larimar is photosensitive and must be stored away from intense heat and continuous exposure to direct sunlight. Estate price $846.00 CAD. Stock #e11572. I don’t know if it’s a good thing or a bad thing but this style of ring is probably the most frequently seen coming in on trade. The 4 invisibly set princess cut diamonds (0.40ct. total weight) look like a single large diamond but they cost about 80% less. 10 round brilliant cut diamonds are channel set down the 6.4mm wide shoulders. Measuring a finger size 5 this ring would fit a smaller lady or we could make it up to 3 sizes bigger if required. The diamonds average SI2 to I1 clarity and IJ colour with a finished weight in 14 karat gold of 5.1 grams. For $838.00 CAD this ring offers perhaps the biggest bang for the buck styles available. Stock #e8434. There’s a reason why they call blue and yellow complimentary colours; they just look good together. White gold is still very popular and white diamonds are always in style. This ring offers a popular look with an alternative colour combination. The natural diamonds are of I1 to I2 clarity and have been permanently colour treated to achieve this interesting slightly greenish blue hue. The ring must be new or only worn a few times. Its flat square section shank still has crisp sharp edges not showing even the slightest ding. 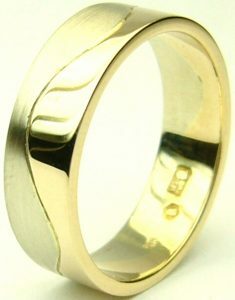 Manufactured from traditional 14 karat yellow gold the size 7 ring weighs 3.1 grams. It could be used as an anniversary ring, wedding ring or maybe just a right hand ring. 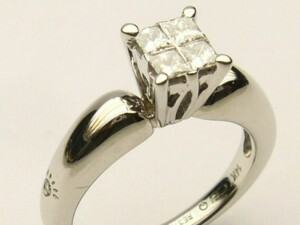 The 5 bar set round brilliant cut diamonds are very secure and sit very low making for a comfortable design. Estimated total diamond weight is 0.40 carats. Estate priced at only $540.00 CAD. Stock #e9545. We love the durability, the density, the purity, the rarity and the soft white colour that platinum offers. What makes this scarce metal so long lasting also makes it waaaaaaay harder to refinish than traditional yellow, white or rose gold. This 2.5mm wide American made ring was worn every day without regard to the type of activity it was subjected to. As such it displays the typical scuffs, scratches and minor dings associated with continuous use. Refinishing platinum takes more time, requires specialized tools and techniques to restore an original mirror finish. We opted to leave this one alone only applying a light polish preserving the original patina. One of our goldsmiths can easily restore it to new condition if you prefer. A full and complimentary restoration will require sanding entire surface with several stages of increasingly finer grit paper. Only after every single minuscule scuff and minor surface imperfection has been eliminated can we take it to the high speed polishing wheel using only specifically designed compounds. To do a full restoration will result in a few percent of metal loss and reducing the overall intrinsic value. We’re happy to do it but it can only be original once. The size 6 ring can be custom fit to virtually any finger size. At 5.0 grams this ring offers excellent value for the estate price of just $420.00 CAD. Stock #e11920. There is so much white gold being sold now I thought it was time for a change. 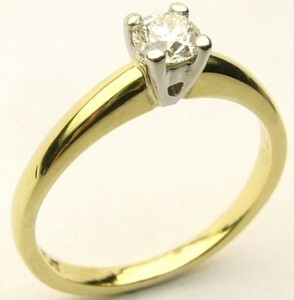 So here is a very traditional yellow gold solitaire engagement ring. 18 karat yellow gold offers a rich colour that is unique in the world of modern white/grey jewellery metals like silver, titanium, stainless steel, cobalt and tungsten carbide. Besides the pinkish hue of copper, gold is only other coloured metal. The traditional beauty of the rare yellow metal is becoming popular again as people are rediscovering why it has been so cherished for thousands of years. This ring is very well made and weighs over 4 grams including the platinum head. The excellent cut 0.31 carat round diamond is a very good SI1 clarity with a little bit of a warmer “K” colour. The flat edge design is very easy to match with a wedding ring or anniversary ring. Measuring a size 8 this ring is a little larger than most but can easily be sized down in a day or so by our on site goldsmiths. A new 18 karat/platinum ring like this could easily sell for over $200.00 per gram not including a diamond. Estate priced at $840.00 CAD. Stock #e8411. This back-to-basics bypass style solitaire is about as modern as they come. The perfect solution for the woman who hates high settings as this sleek number sits only 2.6mm off of the finger. Despite its airy open nature it has significant finger presence, spanning 7.7mm wide. This width gives the 0.24 carat round brilliant cut center a larger impact than you’d imagine, though that might be due to its SI2-I quality and higher cut grade. The 2.4 gram simple setting is made from sturdy 14 karat white gold and currently measures a finger size 7 with room to be sized up or down. The ring is accompanied by all the original Spence Diamonds paperwork showing an original purchase price of $909.00 back in 2011 when the price of gold and diamonds were much less because the Canadian dollar was much stronger. Our estate price for the like new ring is only $490.00 CAD. Stock #e11864. Channel set centre diamond weighs 0.27 carat of good SI-G quality. This setting style gives a different look than a traditional claw setting while at the same time allowing an unobstructed view of the diamond from the side. Not to mention this style makes cleaning quick and simple. Eight bead set brilliant cut diamonds on each shoulder complete the ring. The all white gold setting weighs 2.8 grams and measures a finger size 5.75. Estate priced at $805.00 CAD. Stock #e8278. 100 years from now will the current trend of halo style cluster engagement rings be fondly remembered like this classic solitaire dating from the early 1900s. It’s amazing to me that since this ring was new over a century ago that no one has been tempted to restyle, remount or reinvent this simple yet beautiful design. It may not be the most expensive estate item but if it could talk I’m sure it would be an interesting conversation. Imagine all the significant events both personal and globally that this ring has experienced. I bet it has experienced a carefully planned wedding, perhaps the birth of a child or children, grand children and maybe even great grandchildren. It witnessed both world wars and likely was astonished to see an automobile for the first time. The original 6 claw engagement ring design was invented by Tiffany jewellers in the late 1800s. Although the solitaire ebbs and flows in popularity there’s no denying the beauty. This original scalloped edge flower design is made from the North American standard 14 karat yellow gold and weighs 2.1 grams including the centre diamond. By formula the old European cut diamond weighs an estimated 0.32 carats with a nice SI1 clarity and a typical of the time J colour. The cutting geometry of these old stones differs from a contemporary brilliant cut most noticeably by its tiny table facet and chunky pavilion main facets. It’s a little hard to describe, but compared to a modern round brilliant cut they have a unique sparkle. Including a complimentary size adjustment this antique ring is estate priced at $840.00 CAD. I think rings like this are incredibly underappreciated and represent a great opportunity. Stock #e9573. You don’t see enamel rings around too often. It’s a shame that this technique of fusing glass to metal is not used very much. There is almost no limit to the vivid colours that can be used. The glass coating can take on some very attractive looks depending on how the metal underneath is prepared. This ring has a very dark orange pebbled look. Seven small bezel set diamonds in yellow gold contrast nicely. the yellow gold ring weighs 7.6 grams, measures a finger size 7.5 and is 9.7mm wide. The ring is estate priced at $630.00 CAD. Stock #e7205. The balanced pattern of brilliance and high polished lines make this anniversary band all the more striking. Edged with two petite lines of bead set diamonds and a row of larger channel set rounds for a total weight of 0.75 carats. The 35 round brilliant cut diamonds are of I1-I2-H quality, throwing a lot of light during wear. The ring itself is made from 4.7 grams of 14 karat white gold and currently measures a finger size 5 1/2 with some room to adjust. Estate price $980.00 CAD. Stock #e11665. 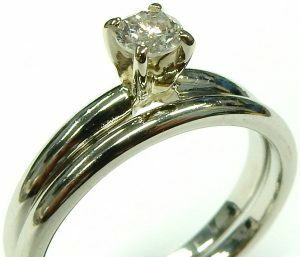 Lovely estate diamond solitaire in a quality, custom made setting for the same or less than just a new mount alone. 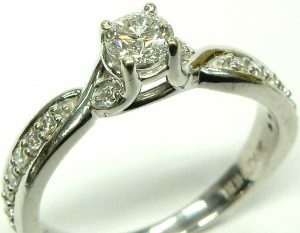 You don’t have to spend thousands or even one thousand dollars to get a great looking bright and sparkly diamond ring. 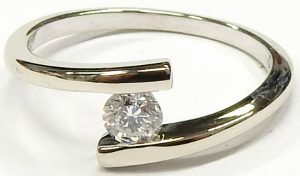 The simple bi-pass style ring although not a totally unique design was custom made with a full solid shank in 14 karat white gold. 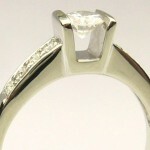 The size 5 3/4 ring contains one round brilliant cut diamond measuring 3.75mm diameter estimated to weigh 0.20 carats. A few tiny crystal inclusions, twinning wisps and feathers limit the clarity to I1. A very good to excellent cut and strong H colour make the stone twinkle much more than you’d think a $455.00 ring should. Excellent condition showing no measurable wear. Stock #e10779. A petite row of diamonds is so universally pleasing it can be stacked against almost any other ring or set. Even its colour doesn’t limit its ability to pair as the tiny prong tips are lost in the brilliance of the diamonds they carry. Viewed head on or from either side the band is all scattered white light and rainbow flashes. Together the 25 SI-H quality round brilliant cut diamonds make a perfect 0.50 combined carat weight. Covering all of the 1.8 grams of the ring except for a small sizing area at the very bottom. The 14 karat white gold ring is in like new condition and currently measures a finger size 5 with a bit of room to size up. Estate price $805.00 CAD. Stock #e11593. 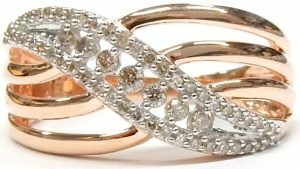 Canadian made with Canadian gold this triple cluster design ring contains 21 good quality SI-HI round brilliant cut diamonds. They are cleverly set to look like three big diamonds. The 14 karat white gold setting weighs 1.8 grams and is a tiny size 4.5 but can be made bigger for no charge by one of our onsite goldsmiths. Freshly polished and looking like brand new. Estate priced at $476.00. Stock #e6582. Timeless Tiffany sterling never lasts long in our showcases! 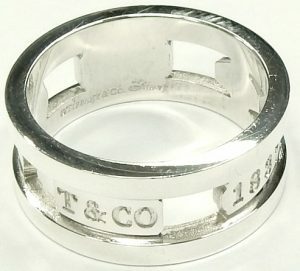 Especially architectural pieces like this pierced 9mm wide band which declares its T & CO pedigree in bold 360 engraving. Though the band weighs a typically substantial 8.5 grams its graceful windows prevent it from appearing overbearing. The band currently measures a larger finger size 9 1/2 making it ideal for wear on a pointer or middle finger. There is some room to adjust up or down but that evenly spaced pattern will be disturbed. Estate price at just $200.00 CAD. Stock #e11432. Maybe it’s nothing more than the psychological attraction of high quality 18 karat construction and the excellent VS1-F 0.21 carat round brilliant cut diamond, but I find this ring quite attractive. Perhaps it truly is a pretty ring that just happens to be made with higher standards in mind. In truth it’s likely a bit of both. Jewellery is a luxury so why not use the best ingredients possible. If you’re looking for diluted gold there are many stores and manufactures out there that will supply 10 karat hollow, light, flimsy settings along with poorly cut opaque diamonds better suited serving duty at the end of a drill bit than in a piece of jewellery. This ring would make a great engagement ring for the lady that likes a super comfortable low setting or maybe use it as a promise ring until the day comes to present something a little bigger. Anything you decide to do with this ring it’s one to be proud of. You’ll never regret buying quality. The ring is constructed from 3.8 grams of 18 karat yellow and white gold with a finger size of 6.5. It can easily be sized up or down in as little as a day by one of our onsite goldsmiths. Estate priced at $999.00. Stock #e9416. 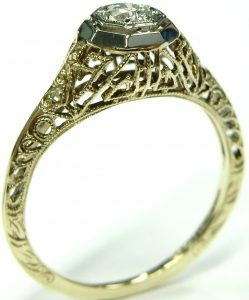 A ring inspired by old world architecture with its peaked top and middle eastern filigree work. On that solid design foundation the 5 gram ring lays a mosaic of 38 diamonds. The contrasting facet patterns play off of each other with two rows of baguettes bisected by a line of princess cuts; adding balance to busy brilliance. The invisibly set 0.66 carats of nice SI-I quality diamonds do have a couple of chipped corners among their ranks which is to be expected really with such petite corners. The unique ring currently measures a finger size 7 1/2 with a limited room to size. These are really big diamonds for just $24.00 a piece (including the gold). It’s a ton of sparkle for the estate price of just $900.00 CAD. Stock #e11095. There’s not much we can’t do at Bill Le Boeuf Jewellers when it comes to custom made jewellery (especially rings) but sometimes it’s the most basic designs that produce the best results. 60 years in business at the same location has taught us that reinventing the wheel isn’t something we need to do. Rings like this cute eternity design are nothing new but they cover all the bases when it comes to successful, flattering and versatile design. Every one of the matching 42 round single cut diamonds in this ring are sourced from trade in or recycled estate jewellery. The 14 karat white gold used in its construction is freshly refined. It was supplied from our estate gold jewellery that wasn’t suitable for resale. This formula for reusing and “upcycling” materials benefits our clients with the undisputed best value in jewellery hands down. This example gives you 0.50 carats of beautiful matching VS clarity, H colour diamonds. Each 0.012 carat diamond is secured in heavy robust shared claw settings around the entire circumference. The 2.3 gram 14 karat white gold ring measures a slightly larger than average 8 1/2. If you think this style of ring is a little tricky to size, you’d be right. We can bore these examples out a little due to the heavy construction up a full size; but most times we’d prefer to make you a new one. We have hundreds of carats in small estate diamonds so we can make up a ring like this in any total diamond weight you have in mind. 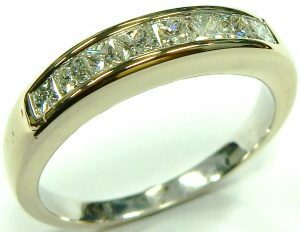 We can do yellow gold, rose gold, white gold, even platinum and we can do it for less than you’d expect. Priced separately each diamond only costs less than $17.00 including the gold setting. Go all the way with a full circle of diamonds, it’s so much more fun than half way and isn’t that what luxury is all about? We can make one up for you in a just a couple of weeks. This ready to go version is estate priced at just $700.00 CAD. Stock #e11187. Why settle, you can have the best without breaking the bank. Platinum prices have been coming down for a number of years now. While still more expensive then white gold, platinum is now a compelling alternative. It’s whiter, tougher, more resistant to chemicals and it’s far less likely to cause irritation to those with sensitive skin. It is also more dense than even pure gold and it’s exponentially more rare. Here’s a ready to go set for way under $1000.00. The traditional solitaire design contains one round brilliant cut diamond estimated to weigh 0.20 carat of I1-K quality. 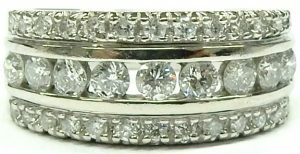 Curiously the original manufacturer set the diamond in a four prong white gold setting while the rest of both rings are made from platinum. If you look closely you’ll notice the four prong top has a subtle yellow hue compared to the pure white colour of the platinum. The 2 rings measure a finger size 7 and weigh a combined 6.1 grams. The traditional design allows adjustment up or down to any possible finger size. 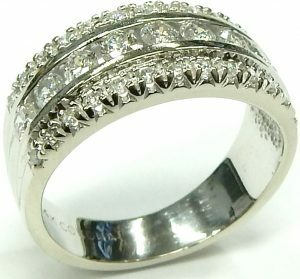 The price of just an empty platinum setting can easily exceed our estate price for this 2 ring set of only $700.00 CAD. Stock #e11514. We have dozens of new and estate anniversary rings like this. From small light 10 karat gold with 0.10 carats of diamonds to over 5.00 carats of total diamonds weight 18 karat gold versions. They come in a style and a budget to suit everyone. I selected this example because the 14 small diamonds are very high quality (VS-GH) and twinkle way more than the 0.17 carats total weight would suggest. The simple 2.6 gram 14 karat white gold setting measures 2.9mm wide in a finger size 5.5. Bead setting allows more light and more sparkle than the channel set alternative setting style. Perfect condition showing no measurable wear. It could also be used a wedding ring, it’s flat edge will fit many different engagement ring designs. Estate priced at $490.00 CAD. Stock #e8902. Most people know to shop for quality when purchasing an engagement ring but it’s sometimes forgotten when the time comes for the wedding ring. Maybe it’s the pressures of the big day looming overhead, making wedding band shopping just another task to check off of the never ending to-do list. The engagement ring is the promise, but the commitment of your vows is locked into your wedding bands to be worn every day as a declaration. You should take as much time and care with this decision as you do selecting an engagement ring. And if, like your engagement ring, only the best will do, than this may be the band for you. Made from 2.5 grams of high quality 18 karat white gold, featuring 0.25 carats total weight of high quality VS-GH baguette cut diamonds. This finger size 6 1/2 ring was put together from all the best ingredients and will be a deserving partner to any engagement ring or wedding set. Estate price $700.00 CAD. Stock #e10146. 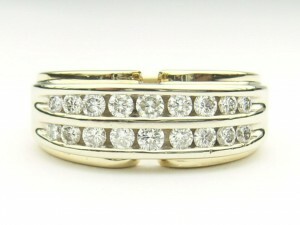 Modern looking Gypsy set diamond platinum band. This ring will fit nicely with any flat edged ring and would make a great anniversary ring for someone with a small finger as this ring only measures a size 4.5. The ring contains 8 small round diamonds of good quality and weighs 3.2 grams. Estate priced at $630.00. Stock #e6964. An understated anniversary band can be a wonderful finishing touch to an existing wedding set or a subtle statement worn on its own. Occupying a quarter of the rings circumference the 0.50 carats of high quality VS-H princess cut diamonds make a very lively impression. Set one right against the other for that uninterrupted brilliance you can only get from princess cuts. Those 8 diamonds are securely housed in a very well made 3.2 gram 14 karat white gold setting that currently measures a finger size 6 with room to adjust. Estate price $735.00 CAD. Stock #e10343. It’s bright, it’s big, it’s well made and it’s a great value. Yes it’s also an I2 clarity, but if you can handle seeing a minor inclusion as a trade off for a significant sized diamond you should consider this one. The grooved tulip shank setting has been a good selling style for many years. It’s traditional with a twist. The low central groove protects the highly polished finish helping keep this ring looking new. The diamond measures 5.48mm diameter as is estimated to weigh 0.62 carats with a very good cut. The K colour estimation is just a bit on the warmer side but it certainly doesn’t look yellow. For under $1000.00 this is a great looking, excellent value ring that should really be considered if a brand new 0.25 carat for the same price just won’t cut it. 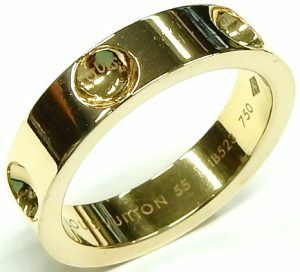 The 14 karat yellow and white gold setting is in perfect condition with a finished weight of 3.2 grams in a finger size 7.25. Full refund available if this is not the best looking diamond for under $1,000.00 you’ve seen. Estate priced at $960.00 CAD. Stock #e8307. Jewellery is all about sentiment; this ring shows it and the packaging isn’t shy about saying it. One of Peoples Jewellers newest promotions is the “Ever Us” line of jewellery. Each piece features 2 diamonds with smaller accent diamonds. The symbolism is obvious and the designs are really quite pretty. Peoples Jewellers website currently shows 56 different Ever Us items. Pendants, rings, necklaces and even bracelets have been designed with the Ever Us treatment. Our latest estate item is the 0.50 carat total weight 14 karat white gold ring. 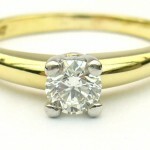 The 22 brilliant cut diamonds are of I2-I quality according to the website but face up and look much better in person. This ring is currently shown on the Peoples Jewellers website with a “Special Limited Time Price” of $1420.00. Our estate price for this like new condition 3.3 gram, size 6 example is $840.00 CAD including the original inner and outer box. Stock #e11123. Custom made tanzanite and diamond ring that was never worn. It’s hard to say if it is a replica from an original 1930-40s design or a modern interpretation of that eras style. It really only matters as a point of interest. What matters is the precise detail and quality of material used in the creation of this ring. 5 grams of 14 karat white gold along with 16 small diamonds (0.15ct. total weight) give it the twinkle. 3 medium tone violet/blue 3.25mm tanzanite are prong set across the centre provide the contrast. Crisp milgrain edges, pierced double gallery are some of the extra touches that you don’t see with many modern mass produced rings. The ring is a little larger than the average in a finger size 9. Brand new with a perfect scratch free rhodium finish. Estate priced at $770.00 CAD. Stock #e8812. In like new condition. 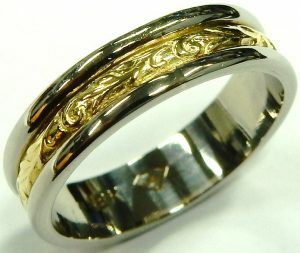 Canadian made wedding band that takes its inspiration from ancient Roman architectural scroll work. The 4.9mm wide band is very well made from 4.2 grams of high quality 18 karat yellow and white gold, with the fancy details in high relief to ensure it lasts. The band measures a finger size 6 1/4 and can be sized up or down but the pattern would be disturbed. Estate price $420.00 CAD. Stock #e10080. “Rings under $1000” is one of the most popular categories in our estate jewellery collection for good reason. Just have a look at what less than $1000.00 can buy. This contemporary 14 karat white gold engagement/wedding ring set is in like new condition, it only needs a fresh rhodium plating to be considered new. The centre diamond weighs 0.16 carats and the 80 other small brilliant cut diamonds add an additional 0.41 carats of weight. All the diamonds are of nice bright I1-I quality. The ring too is a nicely made quality piece. The diamonds are all set properly with good claw coverage. The set weights 7.6 grams in a finger size 7. Considering a new ring set like this can often sell for around $140.00 per gram or more without any diamonds, this is an excellent showcase of the value estate items offer. The two ring set is estate priced at $980.00 CAD. Stock #e8180. Providing generations of customers the best value in new and estate jewellery gives us a great sense of satisfaction. Doing so without any fancy promotions or gimmicks is even more rewarding. We tell it like it is and our clients get it. Jewellery can be inexpensive and offer little value and it can be very expensive yet offer incredible value. Our latest estate ring offers fantastic value for a small price. This 3 stone diamond ring looks very significant with a conservatively estimated total diamond weight of 0.79 carats. Sure the stones display some warmth with the MN colour but they sparkle just fine thank you very much. Easy I1 clarity with clean centres means they look completely transparent to the naked eye without artificial magnification. The setting is a traditional cathedral shoulder design executed in 14 karat yellow and white gold. The size 5 ring weighs 3.2 grams and can easily be adjusted a couple sizes larger if required. 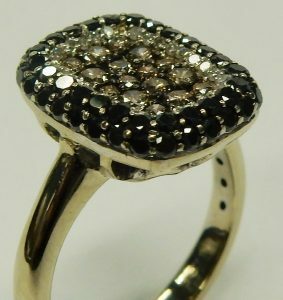 Come in and have a look at big and how nice $280.00 per diamond can be with this estate ring. Stock #e11182. Consider the outstanding value offered by estate items like this. 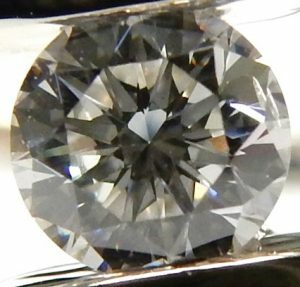 Almost 1/3 of a carat round brilliant cut diamond solitaire of nice I1 clarity, I colour and very good cut measuring 4.3mm x 2.7mm. The bright sparkling diamond is set into a classic 14 karat gold yellow and white gold “tulip” shank setting that weighs over 3 grams. Excellent condition polished up good as new in a finger size 6. Buying an estate item is not like buying a rusty old used car. There are no moving mechanical parts to fail and no systems to break down. Maybe a sizing charge or a claw repair every 20 years or so, and that’s it. 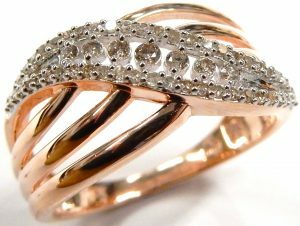 Diamonds are around 4.5 billion years old and there’s a good chance the gold in this ring is from a recycled source anyway. Recycling and reusing is environmentally friendly and budget friendly too. You can feel good about this purchase and know you’re getting far better value than any new ordinary ring from the mall. Estate priced at $600.00 CAD. Stock #e8244. This trendy take on the diamond solitaire is obviously meant as a high quality companion to the petite layered rings of Pandora and David Yurman. 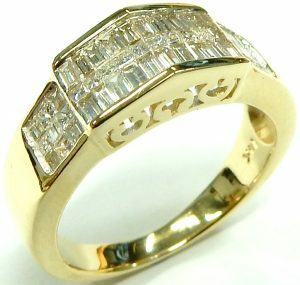 The ring has been very well made from 4.6 grams of warm 14 karat yellow gold with a shank that measures 2.75mm wide. Bezel set into the 6.40mm dome is a sparkling 0.08 carat round brilliant cut diamond of nice I1-I quality. The ring measures a slightly larger than average 9 1/4, it can easily be sized but it would actually make a really nifty thumb ring. Either way, worn partnered with other rings or alone on its own finger or thumb the ring is bound to make an impression. Estate price $490.00 CAD. Stock #e10218. Very cute little engagement ring with something a little different. 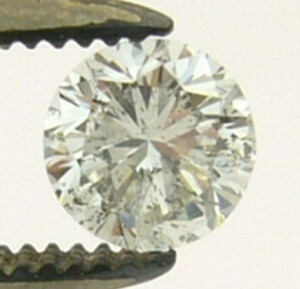 The 0.25ct. oval diamond measures 4.39mm x 3.68mm x 2.30mm and is of good quality SI1-GH. 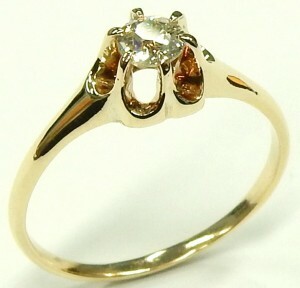 The traditional yellow gold 14 karat gold solitaire weighs 2.1 grams and is in like new condition. Estate priced at $525.00. Stock #e6132. Kavar Jewellers is a family run mini jewellery chain of four stores in the Toronto area. Each store is run by one of the four Konialian brothers. They opened their first store in 1985 in the Upper Canada Mall and have made a reputation for the wide selection of trendy brands they carry alongside their own in house lines. This 0.79 carat blueish purple oval tanzanite and 0.12 carat (I1-JK) diamond halo ring is from Kavar’s in house line. It’s well made from 3.4 grams of 14 karat brightly rhodium plated, unrefinished white gold and measures a finger size 6 1/4 with lots of room to size. The ring came in showing no signs of wear, sparkling and ready to go. There is not even the slightest scratch on the rare tanzanite African gem. Estate price $770.00 CAD. Stock #e9698. The perfect study of contrast, the ring uses highly polished white gold to balance the brilliance of the diamonds it holds. All 0.32 carats are surrounded by narrow vines of 14 karat white gold. The Canadian center being no exception as a subtle gallery frame peaks out around its edges. Don’t let the modest price fool you, the 1/5 carat centre diamond isn’t insignificant measuring 3.85mm diameter. It’s been laser engraved with a unique serial number confirming it is of Canadian origin. All 17 diamonds are of a well matched I1-GH quality and all shine brightly during wear. The petite 2.4 gram ring currently measures a finger size 5 1/2 with some room to adjust as needed. Estate price $420.00 CAD. Stock #e11458. 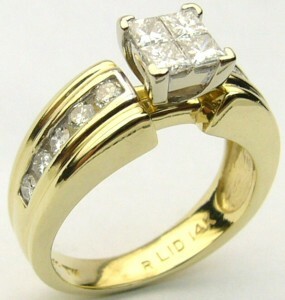 14 karat yellow and white gold anniversary ring made in Canada by respected manufacturer Libman and Co. this 0.50ct. total diamond weight ring is in like new condition and weighs over 7 grams. The diamonds are graduated in size and are of good quality (SI-I) and well matched. The ring is estate priced at $997.00. Stock #e6172. Tanzanite is one of the newer gemstones on the market, discovered by a Masai tribesman in the late 1960s. The violet blue gem is only found in the foothills of Mount Kilimanjaro in Tanzania, thus its name. It actually forms brown and through natural heat exposure within the earth or through heating during production it turns a range of colours but is most known for the colour seen in this estate ring. That brilliant violet blue tone is what captivated Tiffany & Co. when they first encountered the gem. They named the stone and introduced it to the market as only available in two places in the world; Tanzania and Tiffanys! As with all things Tiffany the industry caught on and soon everyone was carrying it. This well made bypass style ring is not Tiffanys but it’s certainly of their quality. Weighing in at a sturdy 3.6 grams, made from 14 karat yellow gold and set with 0.25 carats of accent diamonds for added brilliance. Currently the piece measures a finger size 6 1/4 with some room to adjust as needed. Estate price $476.00 CAD. Stock #e11554. The ancient Egyptians named peridot the “gem of the sun”. It certainly earns its name looking at this 5.8mm in diameter faceted round peridot that appears to be lit from within. The bright green is made more intense in contrast with the high polished 3.8 grams of 10 karat white gold that make up this 4.75mm wide ring. To finish off the modern look two round brilliant cut diamonds have been channel set into each domed shoulder. The 0.12 carats of sparkling diamonds work together with the illuminated peridot to make an eye catching, contemporary piece. Currently measuring a finger size 6 1/2 with the ability to go up or down one or two sizes. Estate price $413.00 CAD. Stock #e9803. Very low setting well made 14 karat yellow and white gold ring. Contemporary looking solitaire design was constructed from 3 different sections of 14 karat gold weighing 4.1 grams, finger size 7. The centre diamond weighs 0.23 carats of nice SI-HI quality. The two tone construction contrasts nicely with sections of high polish and other sections with a brushed texture. This ring would make a great engagement ring for someone who likes a ring that will not get in the way. The flat edges make it very easy to fit a wedding or anniversary ring along side. The ring is in like new condition estate priced at $700.00. Stock #e7626. 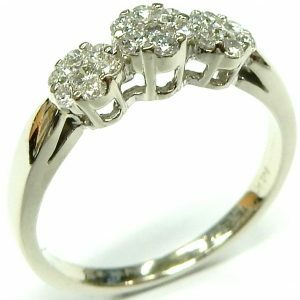 For less than $20.00 per diamond you can express your love for an eternity with this diamond anniversary ring. The eternity ring design is made from 30 bright diamonds of nice “I” colour and pleasant I1-I2 clarity. We’re very tough when it comes to our diamond grading standards at Bill Le Boeuf Jewellers. You’re going to be quite surprised when you see just how sparkly these diamonds are. The size 8 1/4 ring can be sized down if necessary by removing a diamond or two. The 10 karat traditional yellow gold design is in perfect condition showing no wear of any kind. We have many diamond eternity rings in stock made from white gold but very few in yellow. For the estate price of $560.00 this is a lot of ring with plenty of bling. Stock #e11693. Ever price out having a custom made diamond engagement ring produced? It’s definitely more expensive than purchasing a production model. If you want something completely unique or have multiple stones to combine into a single design sometimes custom is the only option. This classic cathedral shoulder solitaire was custom designed by local jeweller Jeff Walters. There are many off the shelf examples of this style but for some reason the original owner decided on having it custom made. Jeff Walters Jewellers did a great job making the size 5 1/2, 14 karat white gold solitaire. The ring features solid shoulders, thick shank with very little taper and a sturdy double gallery setting to secure the center diamond. A 0.44 carat (by scale) VS2-J round brilliant cut diamond is showcased in the less is more design. The very good cut diamond measures a significant 4.85mm x 2.90mm facing up far more white than our conservative J colour estimate. 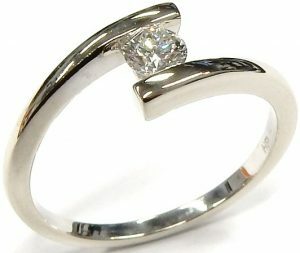 For under $1000.00 you can buy a full custom made good sized diamond engagement ring. The ring is in like new condition, a simple rhodium plating will have it looking brand new. Estate priced at just $950.00 CAD. Stock #e11502. 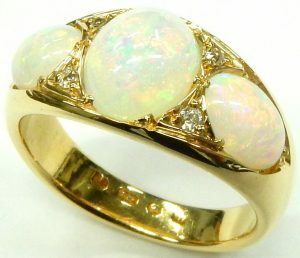 This beautiful antique estate opal ring almost didn’t make it as a showcased item on our website. The centre stone is exhibiting some surface crazing. 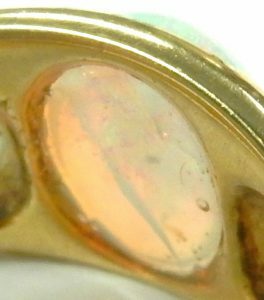 This sort or defect is not that uncommon with opals and antique opal in particular seem to be a little more prone to the phenomena. The cause is not fully understood but as long as it is not severe and doesn’t affect the beauty there is no reason why the jewellery can’t be used. The crazing on this example is only visible from the bottom. Our theory goes a little like this; if this ring has survived over 100 years so far we doubt the crazing is going to get any worse with careful use. The three oval opal cabochons are calculated to weigh 3.24 carats in total and are very well matched. They exhibit very good play of colour across the entire surface in almost the entire spectrum of pastel colours. These simple still images don’t come even close to showcasing how pretty and colourful the opals are. Bead set between the opals are 4 small round European cut diamonds estimated to weigh 0.06 carat in total weight. 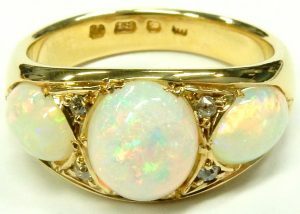 Although it is possible to adjust the size 8 1/2 ring up or down slightly it would be best practice to leave this antique ring in its current size as putting undue stress on any opal is not recommended. The overall condition of the ring is excellent showing very little use. The three opals show perfect polish across their domed surface. I imagine this ring was used very little over the last 100 years or so. Estate priced at $980.00 CAD. Stock #e10848. Jewellery of the middle ages was one of the main modes of communicating your social class to the world. As such many people of the middle class spent great fortunes on their embellishments in the hopes of fooling those around them into overestimating their success. This meant that the truly wealthy had to wear even larger and more lavish pieces to not be mistaken for the middle class. Eventually laws were put in place to police the over wearing of jewellery by the middle classes. 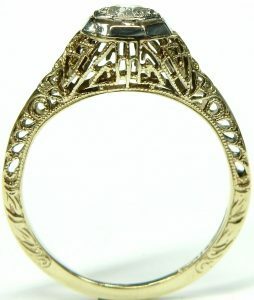 Rings were especially important for communicating royalty and high nobility and thus were some of the largest and most ornate pieces of the time. This of course is not a thousand year old ring, but it is absolutely of Medieval inspiration with its heavy angular lines in brushed and high polished 14 karat yellow gold echoing the shape of the Maltese cross. The deep blood red of the 0.46 carat natural ruby is set with 0.18 carats of bright round brilliant cut diamonds, finishing of the regal motif. The 5.2 gram ring measures a finger size 7 with room to adjust up or down as needed. Estate price $700.00 CAD. Stock #e9964. 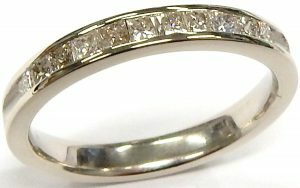 Often with channel set anniversary bands there is a limited amount of room for changing the finger size, due to the diamonds sitting so close together. Sizing the ring up brings the diamond closer by reducing the curve they’re on potentially causing damage. Luckily we have such a variety of estate channel set anniversary bands we likely have one in the finger size you need, or close enough to adjust. This band in particular is a slightly larger size 9. Made from 3 grams of brightly rhodium enhanced 14 karat white gold. We have opted to leave it in its unpolished condition. We can do a complimentary full refinishing in about 5 minutes if you wish. The top half is set with 0.55 carats of well matched I1-HI round brilliant cut diamonds, 12 all together. 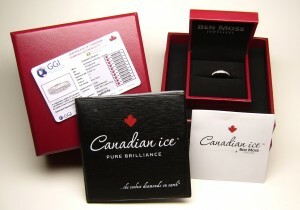 The ring is accompanied by its original Gem Scan summary evaluation wallet card (April 2013). Estate priced at just $770.00 CAD. Stock #e11401. A 0.17 carat SI1-HI round brilliant cut diamond never looked better than this. 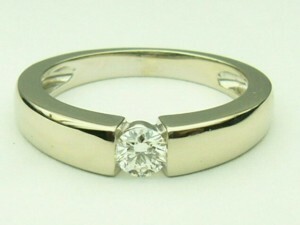 The simple low “compression” look setting made from 14 karat white gold weighs 3.2 grams and is in perfect condition. Size 5. Estate priced at $490.00 CAD. Stock #e7057. It’s not an ear, it’s not 1/2 a question mark. I think it’s a custom made “sustain” musical note. Maybe some a musician out can confirm my thoughts. The interesting design looks pretty whatever it is. Made from 4.2 grams of traditional yellow gold channel set with 9 graduated high quality VS-GH round brilliant cut diamonds. The ring measures a size 7.5 and can be adjusted up or down as required. This ring would make a great gift for the musician in your life or given as a symbol to display your “sustained” feelings for someone. There are many ways to interpret the symbolism of this ring, just use your imagination. Estate priced at $910.00. Stock #e7298. This style of ring has become very popular because you get the look of a 1.00 carat solitaire for the price of a 0.25 carat. A close look at the photo shows 4 small princess invisibly set without any metal prongs on any of the inside diamond edges. 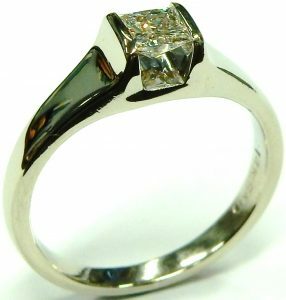 The 4 princess cut diamond are of very good quality for this type of ring SI-H and are very well matched. The 14 karat white gold setting weighs 4.0 grams and is in excellent condition. Estate priced at $700.00. Stock #e6583. Natural pink topaz are very rare and do not occur often. This pink topaz is no exception. It is a genuine topaz but it’s colour is not natural. It is a result of a pink surface coating applied to the back of the normally colourless stone. This coating is stable as long as the stone is not subjected to extreme heat from a jewellers torch or submerged in an acidic cleaning solution. Set on the shoulders of the ring are 6 small diamonds (0.07ct. tw.) of average quality I1-I. The ring was cast from 4.0 grams of white gold and measures a size 9. Always ask the jeweller if their coloured stones and diamonds are treated in any way. Most artificially colour enhanced gems are significantly less expensive than their natural variety versions and the customer should be made aware of this. 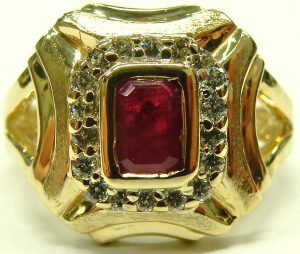 This ring is estate priced at $420.00. Stock #e6838. Being voted Barrie’s favorite jeweller for more years than we can remember is a genuine honor, we take your recognition very seriously. There are many accomplished jewellers in the area who can provide some great products. Few have been around as long as we have and none have the depth of inventory, knowledge and passion as the people from Bill Le Boeuf Jewellers. As we approach our 7th decade of operation in Downtown Barrie our sense of tradition and passion only grows stronger. Our skills plus efficiencies of operation allow us to provide our customers the absolute best value in all varieties of new and estate jewellery. Values like this 0.50 carat total diamond anniversary ring are truly remarkable when you compare what others charge for similar. It’s no wonder we’re busier than ever doing business from our one and only location at 52 Dunlop Street West. The 14 karat white gold ring is in like new condition measuring the average finger size 6 1/2, weighing a sturdy 3.4 grams. The solid shoulder design contains 10 sparkling channel set round brilliant cut diamonds conservatively graded SI clarity and I colour. If you need the ring adjusted in size up or down one of our onsite goldsmiths can accomplish the task in only a day or two. We have many other anniversary rings in stock that don’t appear online. Come in to see what else we have and what we’re all about. This like new example is estate priced at only $840.00 CAD. Stock #e11508. When men come in shopping for their partners we often run them through a series of questions about her tastes, her wardrobe, her pastimes. The goal being to find a piece of jewellery that suits her lifestyle as well as her personal aesthetic. I’m sure many women would sigh at the limited information some partners can give but you’d be quite surprised how much attention most of them pay. In five minutes they can paint a very detailed picture of exactly the type of person she is. One of the big questions is her feelings on heart jewellery; for some women it is the sweetest adornment she could receive, for others its quite the opposite. There seems to be no middle ground, you love them or you hate them. If the former, this trinity cluster ring is the prefect combination of symbolism. The three clusters representing your past, present, and future together and each decorated with a heart shaped undergallery. Together the clusters make a perfect 0.50 carats of nice SI2-I round brilliant cut diamonds. The trio throw a ton of light in every direction and the 14 karat white gold ring itself is well constructed, weighing a sturdy 3.7 grams. Estate price for all this sentiment only $700.00 CAD and only at Bill Le Boeuf Jewellers. Stock #e11926. Deep royal blue lapis lazuli was prized along sapphire in ancient Egypt, Rome, Greece, and China. In modern Western societies it’s not known such a status but has seen the palette of many goldsmiths and designers looking for a durable and versatile azure. Lapis is the perfect medium for carving. Those that are veined with gold coloured pyrite make the ideal center for alloyed gold jewellery. The pyrite in this royal blue example is very close to matching the tone of the 14 rose gold that houses it. The rectangular gem has been curved to follow the angles of the geometric ring top, making a sleek vintage statement. The hand made ring is very solid, weighing an impressive 9.5 grams. 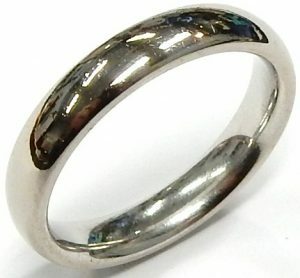 At a finger size 6 with a top measuring 14.6mm wide the ring is perfect as a gents pinky ring or a ladies fashion piece. Estate price $540.00 CAD. Stock #e11937. Our customers love these old hand engraved antique/vintage wedding rings. They were made in a time when the only way to produce the intricate patterns and designs really well was by hand engraving. Both of these rings are likely from the 1930s and are both made from premium quality 18 karat white gold. One is a size 7 1/2 and the other is a size 8; we can adjust them up or down a size or two if required. There are very few hand engravers around any more and most people today would have a difficult time accepting the significant cost involved in recreating something of this quality today. They are estate priced at less than $110.00 per gram, $252.00 and $350.00 CAD. Stock #e11725 e11726. For thousands of years people have been creating beautiful items of jewellery. As skill and technology improved, designs took advantage and became more detailed and intricate. Many styles have come and gone leaving little impact on the overall craft. Most are just a footnote in an obscure reference book. Art Deco designs are admired and have often been drawn upon for inspiration since the movement exploded on the scene in the 1920s. Art Deco influence can been seen in everything from jewellery, cars, architecture, furniture, clothing and even household appliances of the era. Almost everything was given the Deco treatment in the 1920s and 30s. Our latest estate piece is a time capsule from the later part of the period. It’s been remarkably preserved in its original condition. No evidence of any repair work aside from a size adjustment at some point in its history. The delicate saw pierced filigree gallery is perfect. The tiny milgrain details look flawless despite being around 80 years old. This basic style of ring was extremely popular and hundreds of thousands were sold. We get one in every once in a while but it’s usually been loved to death, completely worn out or damaged beyond repair. It’s a real treat when we get to showcase one in this sort of condition. The bright 0.10 carat diamond is also an original and rare Swiss cut diamond correct for the ring. Swiss cut diamonds have a facet pattern half way between a single cut and a brilliant cut. They have no bezel facets and half as many upper/lower girdle facets compared to a round brilliant cut. This diamond is likely from South Africa as that was the primary source of diamonds early in the 20th century. I1 clarity with a G colour give this diamond excellent sparkle, delicately bead set in a ultra premium 19 karat white (you can’t get any better white gold than this 79% pure gold alloy). The square frame setting helps make the diamond look a little larger than it really is. People are always asking for this style of ring and when we get one they don’t last long. If you’re a fan of beautifully designed antique jewellery this is a must have for your collection. The 2.1 gram, size 7 ring can be adjusted up or down a size by one of our onsite goldsmiths in just a day or two. Very hard to find in this sort of condition and estate priced at only $419.00 CAD. Stock #e11959. If coloured gemstone jewellery sounds like a scary commitment, you should try a splash of colour surrounded on all sides by diamonds. The top quality 0.35 carats of natural perfectly red rubies (looking slightly pinkish in these pictures) are elevated here to an elegance that can be worn with anything. The 44 round brilliant cut diamonds that frame each ruby are of an equally bright SI-I quality. They break the bold colour up in a motif that looks almost lace like at a glance. Those 0.45 carats are supported by 3 grams of durable 14 karat white gold. The ring currently measures a finger size 7 with some room to adjust up or down. 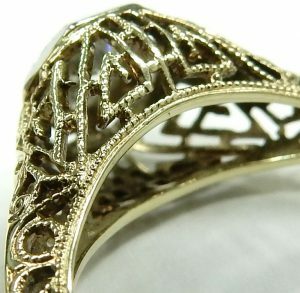 It’s a very pretty ring for the estate price of only $980.00 CAD. Stock #e11854. Something to consider when purchasing an engagement ring is how it will interact with a wedding band. This is especially true with a halo setting which often causes gaping if its under gallery extends all the way down to the finger. The solution to these engagement rings is a contoured wedding band that curves around the halo. But contours rarely stay in place, always rolling away from the halo center, needing to be corrected constantly. A solution to that is the jacket wedding band. 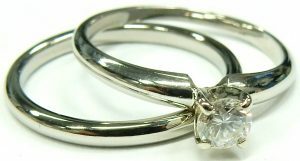 The fixed pair of wedding bands wrap around the halo as normal contours do but the engagement ring drops in between them, locking it in place. The style offers an added bonus of shielding all three from wear by preventing rubbing and protecting the shank bottoms (usually the first area to show wear) with raised bridges. In this instance the engagement ring and jackets are not exactly of the same design but certainly complementary. The 6.3 gram set is made from brightly rhodium finished 14 karat white gold. Together the set has been adorned with 54 round brilliant cut diamond and one princess cut for a total estimate diamond weight of 0.80 carats. All are of bright I1-I clarity which works well for their petite sizes, showing no eye visible inclusions but a lot of fire. The set currently measures a finger size 6 1/4 with some room to adjust. Estate price $924.00 CAD. Stock #e11916. Tiffany 1837 line is a celebration of their founders Charles Lewis Tiffany and John B. Young who opened a “stationery and fancy goods emporium” in 1837. By 1853 Charles Tiffany had taken over the business, shortened its name, and refocused on jewellery. The rest needs no explanation. The Narrow ring measures a versatile 3.9mm wide, equally appropriate worn on its own or stacked. Still in its stock size 4 1/2 the sterling silver ring is accompanied by a Tiffany travel pouch for the estate price of $123.00 CAD. Stock number e11929. 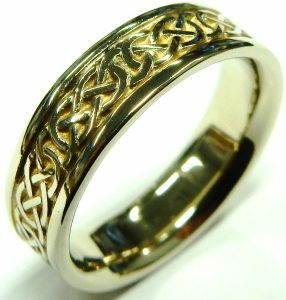 We have hundreds of traditional wedding rings like this for less than you’d expect. Plain Tiffany style wedding rings like this are the timeless symbol of marriage and commitment. We have them in various karats of gold and even a few in platinum. Wide, narrow, big or small we have them all. Wedding rings are continuously coming in on trade. If your integrated wedding ring looks a little awkward on its own, these rings offer a great alternative when less is more appropriate. Sometimes you just want a simpler looking wedding ring for the weekend or going on holidays. These experienced wedding rings make a great option. For under the wholesale cost of new these wedding rings can be refinished to look perfect. This example is made from top of the line 18 karat yellow gold. The size 8 1/4 ring can easily be made smaller or a bit bigger. It measures a discreet 3.4mm wide yet weighs a significant 4.6 grams thanks to its 1.75mm height. The “Tiffany” style soft dome profile has always been the preferred look for wedding rings for over 100 years. Polished up and ready to go for the estate price of only $285.00 CAD. Stock #e11901. Despite the turning tides of fashion a lot of people still view yellow gold as old fashion; the yellow in this set is anything but. That David Yurman inspired rolling yellow gold rope edge frame winds around both cushion tops and down the rings shoulders. Bisecting and bracketing the brilliance of a combined 0.45 carats of I1-HI single cut diamonds and adding interest by contrast. The striking set is made from 9.4 grams of 14 karat rhodium enhanced white gold and warm yellow gold. The ring is currently a finger size 6 3/4 with some room to adjust. The pendant hangs from an 18 inch long 14 karat yellow gold chain with a sturdy spring ring catch. Both are in unworn condition. Sold separately for the estate prices of $420.00 for the pendant and $560.00 CAD for the ring. Stock #e11162 (pendant) and #e11163 (ring). It’s hard to believe that one of the world’s most prestigious luxury brands got it’s start back in the mid 1800s making travel trunks that were durable, secure and easy to stack. The name Louis Vuitton is most commonly associated with their ever popular hand bags, shoulder bags, purses and leather goods. As part or our ever expanding estate department we have a few great examples of the hand bags, but this is the first ring we’ve had. Tiffany and Cartier jewellery items make regular appearances but a Vuitton ring is rare for us indeed. I love the simplicity of design in this Empreinte ring. 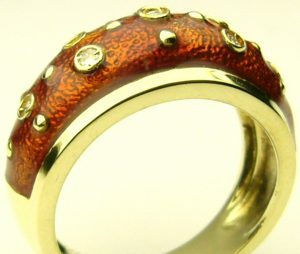 Nothing but a rich 18 karat yellow gold 4.9mm wide band style ring with 6 perfect hemispherical depressions carved out. It’s immediately apparent from the moment you hold it, this ring is of high quality. The tall wall height of 2mm is not often seen even in 10 or 14 karat gold rings. 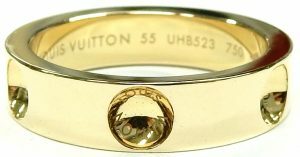 It’s pretty hard to find a nice Louis Vuitton hand bag for under $1,000.00 but you can have this perfect condition ring for a little less than that. The size 7 1/3 ring can be adjusted a bit smaller if we solder or laser weld a couple sizing pucks inside the shank. In a perfect world this ring would be better suited for someone who has a size 7 to 7 1/2 finger size. All the original Louis Vuitton trademarks, serial numbers, purity markings are all fully intact. 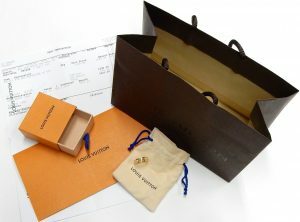 Included with purchase is original pull out box with its never used travel pouch, a sales transaction copy with envelope from 2010 when the ring was purchased new at the Louis Vuitton store in Toronto. Even the original silk handled Louis Vuitton shopping bag comes with a package. The ring looks like new still retaining its crisp sharp edges and exceptional finish. Estate priced at $998.00 CAD. Stock #e11809. As Tiffany describes it this iconic band is “Proudly inscribed with the year Tiffany was founded, the Tiffany 1837™ collection is defined by sleek curves and contours. 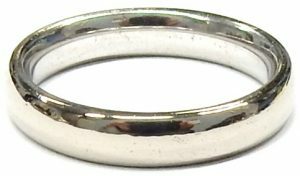 This simple ring exudes sophisticated elegance.” The solid sterling silver Narrow band measures 3.53mm wide and a comfortable 1.48mm thick. The band currently measures a finger size 8 with room to adjust as needed. It is listed new on Tiffany’s website for $205.00 CAD, our estate price for the like new piece is $102.50 CAD. Stock #e11431. Soft, playful, and sleek this little diamond ring is a subtle statement piece. 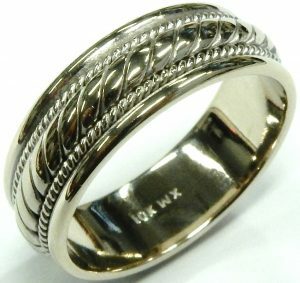 Due to its design the 5.7 gram 14 karat white gold ring sits diagonally when worn, adding an extra touch of uniqueness. Add to that 0.25 carats of bright, sparkling I1-I round brilliant cut diamonds backed with matte finished white gold and you end up with something really special. The ring is surprisingly sturdy making it more than appropriate for constant wear and currently measures a finger size 6 1/2. Estate price $697.00 CAD. Stock #e10298. You know how we know this was a Bill Le Boeuf Jewellers original? Because it’s set with single cut diamonds, the unsung hero of the accent diamond world. Single cut diamonds are simplified versions of the round brilliant cut with 17 facets instead of 57. That simpler facet pattern works well in small diamonds as it creates larger flashes of white and coloured light. That less splintery facet pattern means that single cut diamonds are much less forgiving of inclusions. Luckily the 0.50 carats of single cuts that we hand selected for this eternity band are of a high VS-H quality. The ring itself was made of bright white premium 18 karat white gold and currently measures a finger size 5 1/4. Estate priced at only $26.25 per diamond and the ring comes free. $630.00 CAD. Stock #e11627. As nice as a tightly packed diamond anniversary band can be there are a lot of advantages to the airier spacing of rings like this 14 karat example. First if you are looking for a petite accent to an existing wedding set this staggered diamond version complements without competing. By spacing the 0.125 carats total weight of petite round brilliant cut I1-J quality diamonds, the ring makes a feature of its negative space; creating darkness to brighten their brilliance. 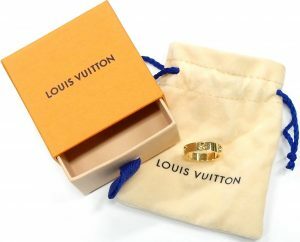 Of course the real advantage to rings like this is their petite price point, like our estate price of only $120.00 CAD. Stock #e10272. 18kt Gucci Icon Bold ring 8.0mm 7gr. $770.00 CAD. e11810. Right hand ring or wedding ring the Gucci Icon Bold ring can do it with a statement making width of 8mm. The name pretty much sums this ring up. Bold, absolutely; iconic too. You can make a pretty strong case that the esteemed Italian brand is one of the world’s most famous. Its pierced Gucci logo is displayed around the entire circumference displaying remarkable precision and amazing polish even inside. It may be a corporate logo but the offset pattern connected with a string of perfectly engraved circles makes for a beautiful style ring. A soft and comfortable low dome profile allows this ring to be worn all day everyday. The size 6 3/4 ring weighs exactly 7 grams and is in like new condition. The highly polished finish is flawless and all the original Gucci hallmarks and shank engravings are in perfect condition. Yellow gold is seeing increased popularity again and the Gucci brand is coming back in a big way. We don’t see many Gucci items pass through our estate department. 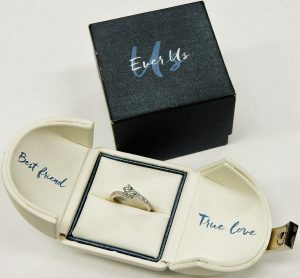 Comes with a Bill Le Boeuf Jewellers blue and white satin gift box. Estate priced at $770.00 CAD. Stock #e11810. If the history of white gold interests you this blog post from Meajean Vintage is worth a read! Our antique Belais wedding band is in surprisingly lightly worn condition, looking almost exactly as it would have when it was made close to 100 years ago. The petite wedding band measures 2.57mm wide and 1.37mm thick. The band’s circumference is covered in a repeating floral pattern which was very popular in the 1920s and 1930s. Made from 2.3 grams of Belais’ patented 18 karat white gold the ring currently measures a finger size 6. 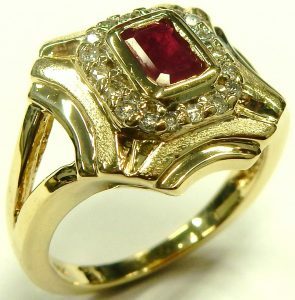 Estate price for this vintage ring $245.00 CAD. Stock #e11683. There’s a lot of sparkle for very little money in this equation. 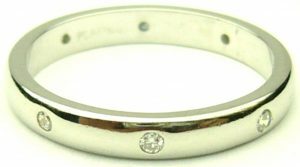 A well priced 14 karat white basic casting of a ring like this would cost around $250.00 to $300.00 without any diamonds. If you had to set the 50 small diamonds domestically expect to pay at least an additional few dollars per stone to secure them. So already you’re over the cost we’re asking for the entire ring without adding the cost of the diamonds. For $420.00 CAD I’m sure a better value would be difficult to impossible to find. This isn’t the simple inline style you typically see, this one has a great oval link design. The open sections in the centre of the links are set with rectangular baguette cut diamonds. The 14 karat white gold ring measures a size 5. 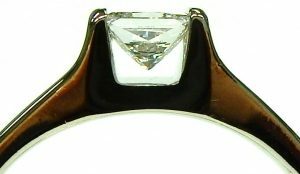 For only $8.40 per diamond including the gold this is a very stylish ring that can be used as an anniversary ring or a stand along right hand ring. Estate priced at only $420.00 CAD. Stock #e10887. For anyone who thinks halos are a new thing in jewellery design this vintage halo trio might come as a surprise. Halo style clusters have been used in some form or another for a very long time. This version is very similar to the modern halo using 36 petite SI-HI quality single cut diamonds to achieve a sparkling perimeter of diamonds. The halo edges are accentuated by a gently scalloped white gold border that shines so brightly it’s hard to distinguish from the 0.25 carats of diamonds. The focus of course is bright royal blue oval sapphires at the centers of these halos. The natural trio come together to make 1.89 carats of deep blue brilliance. 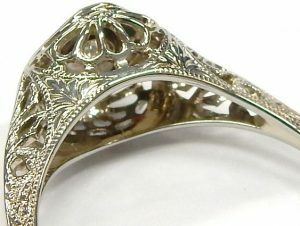 The 14 karat white gold ring weigh 3.8 grams and features a delicate filigree under gallery. Currently it measures a stock size 7 with some room to adjust up or down as needed. Estate price $700.00 CAD. Stock #e10505. Despite its unassuming name green quartz (sometimes referred to as green amethyst) is a rather rare mineral to come across in nature. The designer of this ring was obviously well aware of that as they chose to make the ring of the best ingredients. The gracefully tapered shank and softly geometric gallery have been solidly constructed from 5.5 grams of top quality 18 karat white gold. The 4.50 carat green quartz is accented with 0.20 carats of very good quality VS-SI-GH round brilliant cut diamonds; adding sparkle to its earthy green flashes. The ring currently measures a finger size 7 1/4 with some room to adjust up or down. Estate price $600.00 CAD. Stock #e11233. Now this is a right hand ring! 14mm wide and covered from side to side with white and black diamonds. Likely only worn a few times. The factory rhodium plating is completely intact showing only a few scratches on the shank bottom. An alternating, milgrained, zig zag pattern of contrasting colour plays in interesting, almost dizzying effect. Add some dispersion from the white diamonds plus the black diamonds reflectiveness and you have an optical assault on your eyeballs like no other ring we have in the store. It’s just plain cool. The rest of the ring is nicely made. 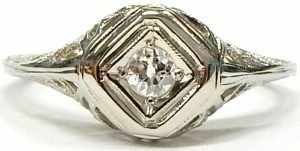 6.5 grams of 10 karat white gold that has been cast with a crisscross lattice in the back making the ring very comfortable to wear and much easier to clean. The added width of the size 7 1/4 ring makes it feel more like a 6 1/2. Our onsite goldsmiths should be able to custom fit it to your finger a couple sizes larger or slightly smaller. Estate priced at just $910.00. CAD. Stock #e11136. The depth of selection and variety of ring styles in our estate department can be almost overwhelming. Although there are around 500 different ladies and gents rings showcased on our website we have several times that amount in stock. It’s too bad we don’t have the time to profile each one in detail online. Some designs are so unique we just have to show them off. The “Slip Knot” is one such ring. This well made, cleverly designed ring features 69 diamonds set throughout the overlapping interlocking knot pattern. The diamonds are conservatively estimated to weigh 0.40 carat with an average quality of I1-H or better. Weighing a generous 5.6 grams and measuring a size 5 1/2 we can adjust it up or down a little bit to fit almost anyone’s finger. This ring is in excellent condition showing very little wear. The tiny outside claws holding the small baguettes still quite tall offering many years of security. Estate priced at $770.00. Stock #e10910. Photographing an amethyst is like trying to take a picture of BigFoot; sure our images don’t come out all blury but capturing the colour and spirit of this regal gem is never right! Seen in person the violet royal purple is far more intense and lively. The highly polished reflective setting that secures the stone amplifies and intensifies that colour vibrantly. The check cut natural amethyst is wrapped with a curving collar of bright, shining round brilliant cut diamonds. All are set into a well built 5.8 gram 14 karat white gold and rhodium plated modern ring that measures a finger size 7 with a bit of room to adjust. Estate price $490.00 CAD. Stock #e11539. Sometimes we like to truly disrupt the market is a small way and throw something out there that really showcases the incredible value we’re able to offer. I know other jewellers are seeing this and scratching their heads in frustration. The price is correct; only $720.00 Canadian gets you this beautiful half carat diamond ring. Simple and timeless solitaire with a flat tulip shank made from 3.3 grams of highly polished 14 karat white gold. The smallish size 5 ring can be adjusted up or down by one of our onsite goldsmiths in just a day or two. 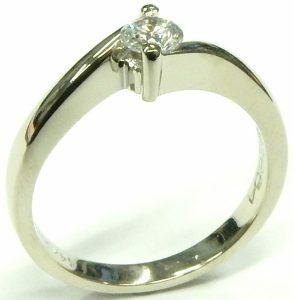 Secured in a sturdy 4 prong setting is a 0.50 carat round brilliant cut diamond of SI2 to I1 clarity and I colour. The very good cut diamond has a diameter spanning a full 5.12mm. 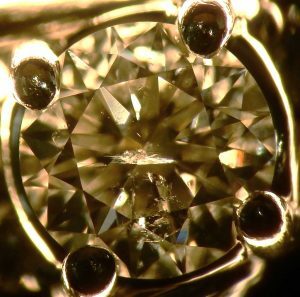 When exposed to long wave ultraviolet light this diamond exhibits strong fluorescence. The cool glowing blue party trick only occurs when the diamond is exposed to a long wave ultraviolet light source in a dark environment. This phenomenon only happens in some natural diamonds, synthetic and created diamonds will never show fluorescence. An explanation of fluorescence is explained on The Gemological Institute of America website. For just $720.00 we know you won’t find a better value in a 1/2 carat diamond ring. Excellent condition showing little to no signs of previous use. There is only one and it’s only priced at $720.00 CAD. Stock #e11592. Michael Smiley Fine Jewellery has been a downtown Barrie destination for handmade designer jewellery for many years. He recently moved to a beautiful new location but we still have the occasional pleasure of showcasing some of Michael’s fine work. 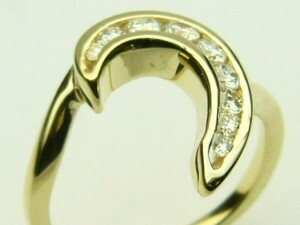 This handmade 18 karat white and yellow gold crisscross ring goes beyond the usual expectations for this style of ring. The yellow band crossing the white on one side and the white band crossing the yellow on the other. It’s little extra details like these that elevate the rings quality and make Michael’s designs stand out. You can wear it showing off the X or you can twist it 90 degrees and emphasize the open sections. The ring weighs a solid 6.2 grams and measures a size 7. It can be sized but it will throw off the symmetry of the design. Estate price $525.00 CAD. Stock #e9721. Here’s a band that was doing “Millenial Pink” before it was cool, captured in crystal clear princess cut natural pink sapphires! The twinkling gems are accented with 0.32 carats of high VS-H quality round brilliant cut diamonds, which set off that soft pastel with busy white and rainbow flashes. The 3.4 gram ring that carries the subtly graduated set has been well made from 14 karat white gold and currently measures a finger size 7. Estate price $770.00 CAD. Stock #e11403. Amethyst is one of the hardest gemstones to capture in pictures. In person this oval brilliant cut amethyst is a velvety royal purple showing flashes of subtle magenta. When in motion you could almost describe its play of colour as glittering in its brilliance. Choosing to keep the focus on such a phenomenal amethyst the designer opted for petite shoulders and 0.05 carats of delicate single cut diamond accents. The 2.7 gram 14 karat yellow gold ring currently measures a finger size 8 with room to adjust as needed. Estate price $280.00 CAD. Stock #e11263. It’s a standard looking anniversary ring with a twist, in fact it’s a 90 degree twist. The 6 princess cut diamonds have been rotated a quarter turn giving them a distinctive “diamond” shape. It gives the ring a totally unique modern look. The 14 karat white gold custom made setting weighs 4.8 grams and contains an estimated 0.66 carats of high quality VS-HI diamonds. One of the end diamonds corner has been chipped but it’s tucked into the gold channel making it completely invisible except under magnification. The ring is quite low with flat edges making it a suitable match for many engagement or wedding ring styles. For less than $1000.00 this ring makes a big statement. With so little of the diamond surface covered by metal it makes each 2.6mm x 2.6mm stone look much bigger. The lack of metal coverage also help promote brilliance and dispersion. 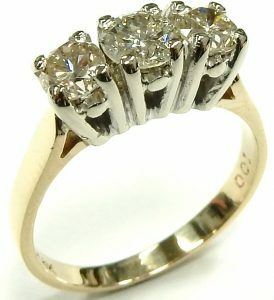 This ring is an easy to see stand out value at the estate price of only $991.00 CAD. Stock #e10414. 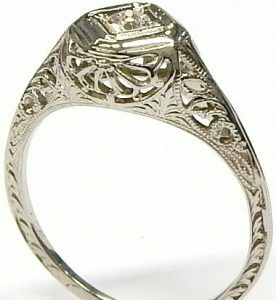 This style of ring dates from the 1950-60s. They were very popular and 1000s were sold to a generation of people who believed in wearing their jewellery all the time. As such, despite the fact we see them quite often most are worn beyond reasonable repair. It’s rare to find one in the kind of condition as this. It appears to be all original. The main claws securing the 3 larger diamonds are well worn but still have some service life left. The ornate detailed gallery walls are in like new condition. Many times these rings were worn with a wedding ring rubbing on the sides for 50 years causing wear to the edges, not in this case. The 5 diamonds are all of minimum SI1-G quality and look much bigger than the estimated 0.45 carats of total weight. 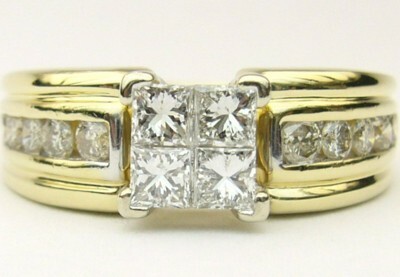 White gold from this era is much whiter than modern alloys enhancing the brilliance of the already very nice diamonds. The 3.9 gram, 18 karat gold ring measures the average ladies finger size of 6 1/2. If you plan on wearing this ring every day for the next few decades we’d suggest re-tipping 8 of the outside claws to keep the diamonds secure. 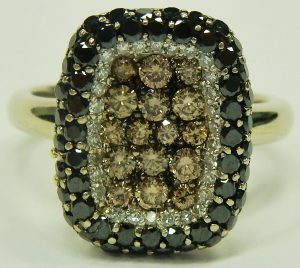 You won’t believe how much sparkle and style you can get for less than $1000.00 in an estate diamond ring like this. Estate priced at $910.00 CAD. Stock #e10787. The layered look is everywhere right now and crisscross rings make a great centerpiece to a stacked set. The overlapping style creates a larger footprint (8mm in this case) while maintaining a delicate and modern feel. Our newest example is a funky take on the classic diamond and sapphire combination. Here the designer chose to back the natural sapphires with black rhodium, intensifying their bright blue flashes. The 0.10 carats of petite single cut diamonds add their unique sparkle to the ring, finishing off the overall brilliance. The ring itself is made from 3.6 grams of 14 karat white gold and currently measures a finger size 6 1/2 with some room to adjust. Estate price $420.00 CAD. Stock #e11309. It’s hard to believe it but this ring is just $160.00. Very good condition, size 5 1/4, containing 10 small diamonds of nice SI1-J quality. 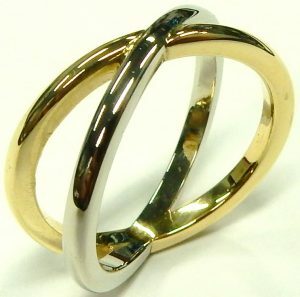 The 1.6 gram, 14 karat yellow gold ring measures 3.0mm wide tapering to 1.5mm. It was made with a very low profile shank that should fit snuggly against pretty much any flat edged ring. The best part of this estate ring; we’ve only priced it for the gold and manufacturing costs. Zero cost was added for the 10 small diamonds. Their value hasn’t even been secretly baked into a higher price point. The absolute truth is small brilliant cut diamonds like these don’t cost much anyway. If priced separately these stones would sell for only around $15.00 to $20.00 each. 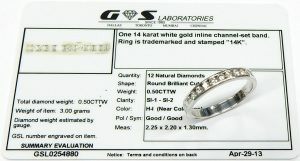 With a lower priced ring, $150.00 represents a large percentage of the total price. At only $160.00 the value of this ring is a real standout. It would make a great little spontaneous gift or a welcome addition to an existing engagement/wedding ring set. It also makes a great travel ring, one that you don’t need to worry about when exploring unfamiliar countries. We only have the one and it’s estate priced at just $160.00 CAD. Stock #e11323. 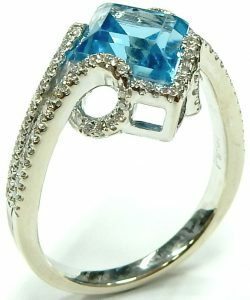 Kite cut gemstones are striking for their rarity but this natural blue topaz and diamond ring is head turning for a number of reasons. The unique step cut center has been inventively set into curling, diamond covered split shoulders that loop down and back gracefully. To accentuate the compass-key outline the points of the topaz have been accented with diamond set chevrons. All told the 0.33 carats of bright SI-HI round brilliant cuts span the entire top two thirds of the ring, covering it over with fire from all angles. The stunning cocktail ring is very well made from 5.2 solid grams of 14 karat white gold and currently measures a finger size 7. The ring is in excellent condition looking like new. The blue topaz is showing just a hint of patina in the form of minor abrasions on some of the crown facet junctions. Estate price $840.00 CAD. Stock #e11313. Sometimes relatively modest components can come to together to produce a really beautiful piece of jewellery. Citrine quartz is a very common and inexpensive gem. 10 karat gold is just about the legal minimum standard of gold that is legal for sale in Canada. When craftsmanship and detail were top of mind, no one produced better jewellery than Canadian luxury jeweller Birks. Especially in the early part of the 20 century, Birks workshops employed only the best jewellers in the industry. Even in entry level gold items like this ring the attention to detail are second to none at any price. Two tone construction without the use of rhodium, expensive hand engraved details and expert assembly are hallmarks of the Birks brand. Just as the price of a masterpiece painting has little to due with the cost of the paint. A ring like this is more about the art of jewellery than the sum of its parts. Not to say the ring does’t offer amazing value too. For only $280.00 I know it would be impossible to do anything close to the quality of this ring. The size 5 1/2 ring can be made a little bigger or smaller by one of our onsite goldsmiths in just a few days. Stock #e11493. For thousands of years people have been creating beautiful items of jewellery. As skill and technology improved, designs took advantage and became more detailed and intricate. Many styles have come and gone leaving little impact on the overall craft. Most are just a footnote in an obscure reference book. Art Deco designs are admired and have often been drawn upon for inspiration since the movement exploded on the scene in the 1920s. Art Deco style can been seen in everything from jewellery, cars, architecture, furniture, clothing and even household appliances of the era were given the Art Deco treatment. Our latest estate piece is a time capsule from the 1920s. It’s been remarkably preserved in its original condition. No evidence of any repair work or sizing adjustments could be found. 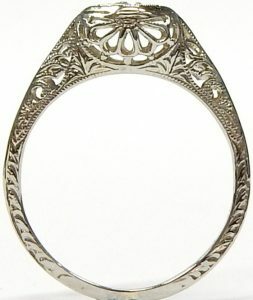 The delicate saw pierced filigree gallery is perfect. The tiny milgrain details look flawless despite being around 90 years old. This basic style of ring was extremely popular and hundreds of thousands were sold. We get them in every once in a while but usually they’ve been loved to death, often completely worn out or damaged beyond repair. It’s a real treat when we get to showcase one in such good condition. The bright 0.16 carat diamond is also an original old European cut diamond correct for the ring. This diamond is likely from South Africa as that was the primary source of diamonds early in the 20th century. SI1 clarity with a H colour give this diamond excellent sparkle. Being delicately bead set in a 14 karat white gold hexagonal frame helps make it look much bigger than it really is. People are always asking for this style of ring and when we get one they don’t last long. If you’re a fan of beautifully designed antique jewellery this is a must have for your collection. The 1.6 gram, size 6 1/2 ring can be adjusted up or down a size but we’d love it to remain untouched for someone with the perfect sized finger to enjoy. Estate priced at only $490.00 CAD. Stock #e11148.